TravelnWrite: Turkey: Bazaar, simply. . .Bazaar! Turkey: Bazaar, simply. . .Bazaar! Bazaars for thousands of years have served as commercial hubs and meeting places in Turkish cities. 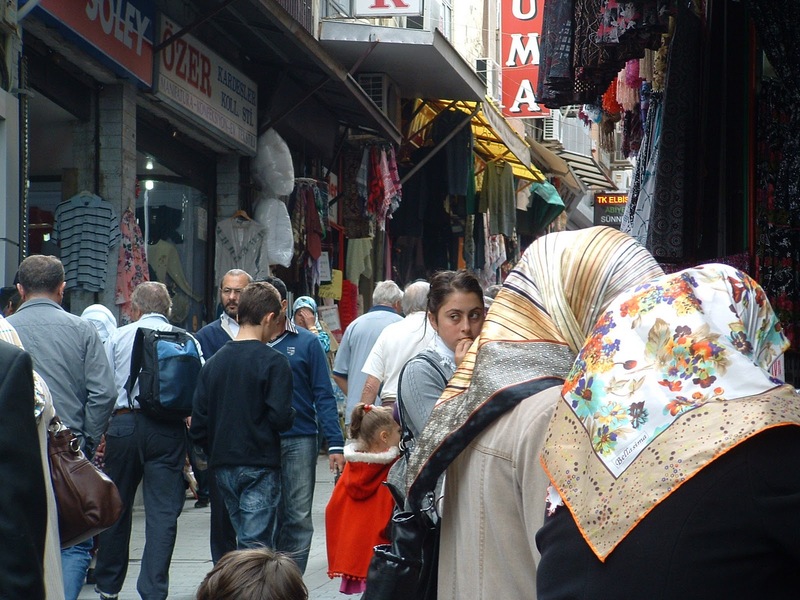 Some, such as Istanbul's Grand Bazaar, have become popular tourist destinations and others operate without fanfare, serving as both market and meeting place for locals - wonderful places to be 'discovered' by tourists such as ourselves. Our HAL cruise allowed us 'snapshot stops' in Turkey's Istanbul, Kusadesi and Trabzon. And at each place we explored at least one bazaar. Each was a different size and shape; the common denominator being that they are refreshing alternatives to the uniformity of our U.S. 'big box' malls. I must admit that we skipped, (for a second time), Istanbul's enormous Grand Bazaar, today a tourist shopping mecca of sorts, that got its start back in Byzantine times. The place grew to be the trade center for the entire Ottoman empire. This colorful, maize of a market place continues to be on our 'next time' list, but with limited on shore time and many other places to see, (not to mention four other cruise ships in town - each with bus loads of cruisers heading to the Bazaar) we decided to save that experience for a future trip. After all, with 4,000 vendors I might need more time there than a cruise stop would allow. Instead, we headed over the Galata Bridge to Istanbul's mid-17th century Spice Bazaar. After all, our Pacific Northwest travel guru Rick Steves' "Istanbul" guidebook had described it as a place where "the air is heavy with the aroma of exotic spices." Okay, so I did find some displays with small canisters of open spice and if I stood close and breathed deep, I could smell them, but this market, like the Grand Bazaar, has 'gone tourist.' The first two shops we passed sold knock-off designer sun-glasses and postcards . . .and little packets of spice - convenient for tourists to tuck into a suitcase. There were samples of Turkish Delight candies and offers of all sorts of items, but we weren't enveloped in the exotic, heavy air ambiance for which I had hoped. 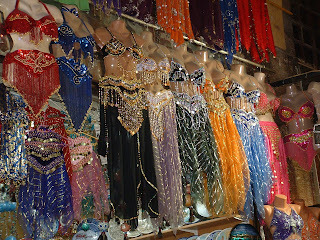 Of course, if adding spice to your life instead of your food was your goal, you could pick up a nice belly-dancing outfit. Just a short walk from where the ship docked, we made it through a gauntlet of vendors who lined a narrow passage way, once a cobbled street in the old city (now covered with green carpet to keep tourists focused on product and not footing). Here, even the slightest pause to look at a display, resulted in vendors calling out, “Hey, Lady! What you want?" “Hey Mister, from America? Come and write a check, I need money." "May I ask you a question? Where you from?" They were a good-natured, but persistent, bunch. And, I might add, the shops were stocked with tourist items. We found our favorite bazaar here. The bazaar (Carsi) district's streets were teeming with shoppers on the Saturday morning we visited. And real shops sold real things to real people: hardware, pottery, clothing, foods, dry goods and linens, scarves and (of course there were plenty of gold jewelry shop for the tourists who made it to the area, as well). We would go back to Trabzon for many reasons and the town's bazaar area is definitely among them. Cruising: A Matter of Dollars and "Sense"
Sevastopol: We're not in Kansas,Toto!